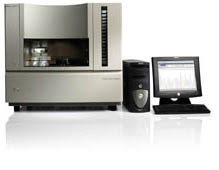 The UCCCC-DSF uses two Applied Biosystems 3730XL 96-capillary and one 3130 16-capillary automated DNA sequencers that yield 700 to 1000 bases per template. 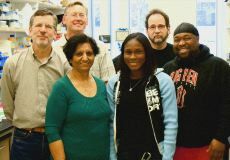 Users provide DNA (plasmid, phage or PCR product) at a standardized concentration and custom primers if necessary, and the Facility performs cycle sequencing reactions using fluorescent dye terminators, runs the capillaries, acquires the data, and provides the sequence as chromatogram and text files. We also run user's reactions, and genotyping (fragment analysis) samples. For chromatogram editing, software is available for Macintosh and Windows platforms (see below). The current charge is $4.25 (Univ. of Chicago) or $7.00 (external) per reaction of a single template and primer ($2.25 and $3 [internal] and $4 [external] to run user reactions). Users are guaranteed satisfactory sequence from their orders even if it requires resequencing new template DNA (there is a 24 reaction limit), or the failed reactions are free. Click here for our redo policy.We are committed to giving every user satisfactory sequence. Our turnaround time is 1 business day from receipt of samples (multi-plate orders may be slightly longer). For high-throughput sequencing ($1.70 to $2.70/rxn, 12 reactions minimum) or genotyping, custom services, such as complete sequencing projects, primer design and synthesis, etc, please call us at (773)702-1088. Free EditView software from Applied Biosystems for viewing and editing chromatograms (Macintosh OS 9.x, 1.5 Mbytes). Free FinchTV software for viewing and editing chromatograms (Macintosh OS X, Windows, Linux). Free 4Peaks software for viewing and editing chromatograms (Macintosh OS X). For further information please contact us by phone at (773) 702-1088 or e-mail.